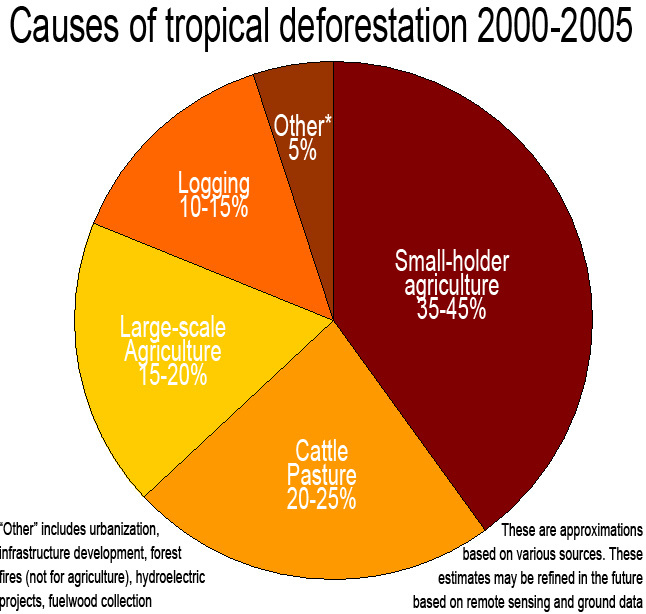 The survey by mongabay.com, most of small-holder agriculture causes the tropical deforestation during 2000-2005. They took 35-45% by farming, commercial agricultural and plantation. Around 20-25% caused by cattle pasture, people produce beef by grazing that changes the forest into the farmland. Then, there are large-scale agricultures that causes tropical deforestation around 15-20%. It mostly about modern farming includes industrialized production of livestock, crops, fish and poultry. Logging took 10-15% of tropical deforestation. “Other” includes urbanization, infrastructure development, forest fires, hydroelectric projects, fuelwood collection, etc took 5% of tropical deforestation.